In 1866, Congress had reduced the number of Supreme Court justices to seven. Republicans who controlled Congress were battling President Andrew Johnson (a Democrat who had assumed office when Lincoln was assassinated), and they sought to deny Johnson any appointments to the Court. By 1869, Ulysses Grant, a Republican, had replaced Johnson, and Congress expanded the number of justices. 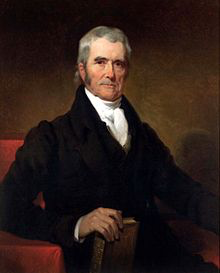 Senator Lyman Trumbull sponsored the Judiciary Act of 1869, which, in addition to setting the number back to nine, also required six justices to form a quorum. President Grant signed the legislation and then nominated William Strong and Joseph Bradley to the newly restored seats. The Act contained other notable provisions. It allowed all federal judges (including Supreme Court justices) to retire with full salary after serving for at least 10 years, provided they had turned 70. Previously, federal judges had no incentive to leave the court before their death, as the government offered no retirement benefits. The Act also created separate circuit judges for the circuits, and it allotted each Supreme Court justice one of the nine circuits in which that justice had to attend at least one term in each of the circuit’s districts every two years. On this day in 1988, Justice Anthony Kennedy was sworn in as the 104th Justice of the Supreme Court. President Ronald Reagan nominated Kennedy as an Associate Justice on November 12, 1987. Kennedy was Reagan’s third attempt to fill the seat of Justice Lewis Powell, who had retired the previous June. Reagan’s first two nominations failed: Judge Robert Bork was rejected by the Senate; and then Douglas Ginsburg withdrew his name from consideration after revelations involving his use of marijuana. In nominating Kennedy, Reagan said that Kennedy, who had been serving on the U.S. Court of Appeals for the Ninth Circuit since 1975, ”seems to be popular with many senators of varying political persuasions.” Reagan’s assessment proved correct. The Senate confirmed Kennedy by a vote of 97-0 on November 30, 1987. On February 18, 1988, Chief Justice William Rehnquist administered the judicial oath (required of all federal judges) to Justice Kennedy in the Supreme Court chamber. Justice Kennedy then took his seat on the far right side of the bench, reserved for the most junior member of the Court. Later that day, the Chief Justice gave Justice Kennedy his Constitutional Oath of Office (required of all federal employees) at a White House ceremony. Kennedy served on the Court until his retirement on July 31, 2018. On this day in 1932, President Herbert Hoover nominated Benjamin Cardozo to the Supreme Court. Hoover, a Republican, nominated Cardozo, a Democrat, to replace Oliver Wendell Holmes, Jr., who had retired at age 90. Although Cardozo was a Democrat, he had support from across the political spectrum. Cardozo had served for 18 years on the New York Court of Appeals, first as an Associate Judge and then as Chief Judge, and his reputation had grown nationwide. Cardozo had written several respected books, including his 1921 classic The Nature of the Judicial Process. He had also received honorary degrees from numerous universities, including Harvard, Yale and Colombia, his alma mater, where he entered the undergraduate school at age 15, graduated at the top of his class, and then attended, but did not graduate from, the law school. Although the brilliant jurist had few critics, some felt Hoover could have been more strategic in his nomination. Cardozo was from New York, and two other New Yorkers—Harlan Fiske Stone and Charles Evans Hughes—were already on the Court. Justice Louis Brandeis, the first Jewish justice, was still on the Court. Yet Cardozo had two powerful Republican Senators on his side: William Borah of Idaho, chairman of the Foreign Relation Committee, and George Norris of Nebraska. The Senate Judiciary Committee unanimously approved Cardozo’s nomination on February 20, and the full Senate unanimously confirmed his nomination by voice vote, without debate or roll call, four days later. Justice Cardozo took his oath of office March 14, 1932. He served until July 9, 1938. On Monday, January 15th, the Supreme Court heard oral arguments in two cases involving statutory interpretation. Thacker v. Tennessee Valley Authority (TVA) raises the question of whether the TVA is immune from tort liability as a government entity. Gary Thacker and a friend were fishing on the Tennessee River. At the same time, the TVA was attempting to raise a downed power line that was above the part of the river Thacker and his friend was located. An electrical component hit Thacker, severely injuring him, and his friend, killing him instantly. Thacker attempted to sue TVA, alleging negligence. The TVA Act, which created the TVA, provides that TVA is a corporate entity that can be sued. However, the district court dismissed Thacker’s suit on the basis of governmental discretionary function immunity. The issue in the case involves whether that immunity is available to the TVA. A discretionary function immunity provision is codified in the the Federal Tort Claims Act of 1946 (FTCA), which allows individuals to sue the federal government for tort liability. But the TVA is not covered by the FTCA. As a result, the issue before the Court involves when and whether to infer such an immunity into the TVA Act. You can read more about the question on Jurist, and the Federalist Society has posted a helpful video explanation. The second case the court heard, Rimini Street, Inc. v. Oracle USA, Inc., involves the scope of costs that can be awarded to a plaintiff under the Copyright Act. The Court might read the statute to authorize the same relatively narrow set of costs that are taxable in most litigation or a broader set of costs that would “come closer to compensating a party for all of its litigation costs.” You can read more at The National Law Journal. This post was written by ISCOTUS Fellow Breana Brill, Chicago-Kent Class of 2020, edited by Matthew Webber, ISCOTUS Editorial Coordinator, Chicago-Kent Class of 2019, and overseen by ISCOTUS Co-Director Carolyn Shapiro.